Have you been losing sleep thinking about the chaotic mess in your garage? It might seem a hopeless task but worry no longer, as we are here to give you a hand. We, at “Garage Storage Solutions in Ennis” can help you in this regard and provide you with solutions that can make it easier for you to get your garage organized. The following are some of the service that we offer for organizing garages. The walls of the garage provide a unique opportunity for you to hang all the stuff that you need on a regular basis. However, common garage walls cannot be used for hanging. The garage slatwall systems we offer however give you the chance to convert your garage wall into a shop wall where anything and everything can be hanged with ease. Racks play a very important role in clearing up floor space. They give you the chance to place some of the items that you need to access from time to time on them rather than in the clutter that is present on the floor. Our garage storage racks are made to withstand heavy loads so that you can put even some heavy things on them as well to make floor space. When it comes to organizing a garage then our garage storage organization service is really what you need. In this service, we focus on evaluating the space that is available and how best to utilize it so that not an inch of space gets wasted. We firmly believe in customer satisfaction and all our services are geared towards ensuring this. We take great pains to make sure that we deliver the best possible service according to the demands of our customers. For this reason, all of our storage solutions are customizable and can be configured according to your preferences. 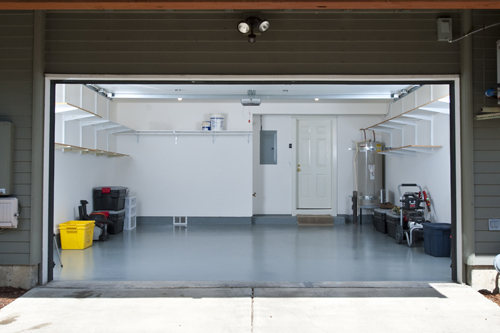 We offer customizable garage floor installation for more aesthetic and durable floors. In other words, we can change your garage entirely. So, if you are having trouble in clearing out the clutter from your garage, give us a call and we will be there for you.